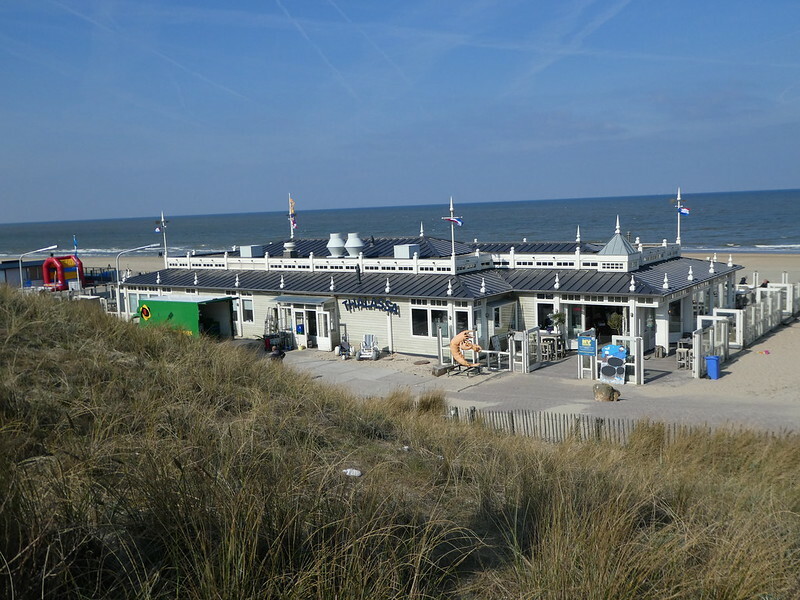 Our morning was going to start with a short train journey to Haarlem but noticing the train terminated less than ten minutes later at the seaside town of Zandvoort, we thought we’d head there first before returning down the line to visit Haarlem. Unusually for us, we hadn’t researched Zandvoort, otherwise I doubt we would have bothered going. The resort, if one could call it that, lies just a few minutes walk from the station but it held little appeal and was totally lacking in charm. We ventured along the promenade which had a few kiosks selling the usual seaside paraphernalia and one or two beach bars which appeared to be closed, the resort had the same feel as Cleveleys in north west England, having seen better days. I’m sure it looks more appealing in midsummer when the beach bars are open and people are relaxing on the beach. So, after a stroll through Zandvoort we returned to the station for the short journey back to Haarlem, the capital of the province of North Holland. The city lies at the centre of the Dutch flower growing district being close to Keukenhof Gardens and the bulb fields of Lisse and Hillegom. The medieval centre is a ten minute walk from the station along cobbled, narrow car free streets. 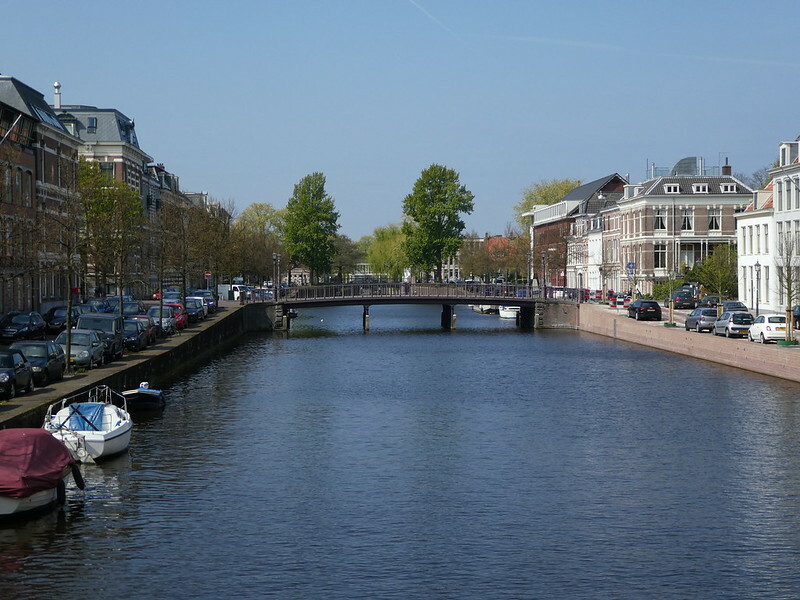 Crossing the broad canal into the old town we found that Haarlem had plenty of the charm that it’s neighbour Zandvoort lacked. Beautiful tall Dutch terraced houses lined the canal with more fine examples of Dutch architecture in the main square. I’m sure the square usually looks photogenic but sadly like Dam Square in Amsterdam, it was filled with a funfair and Ferris wheel obscuring the buildings behind. 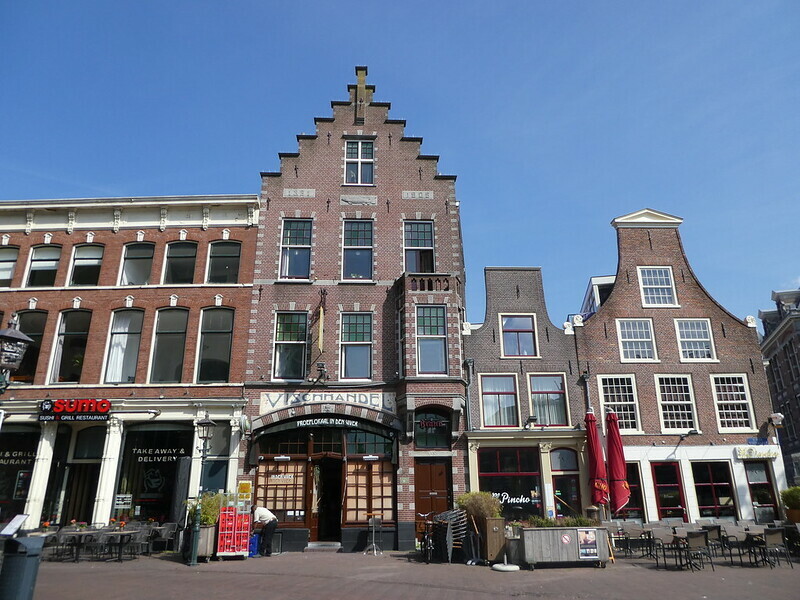 Haarlem’s shopping centre extends over several streets and has many interesting small shops and cosy cafes. After having our morning coffees in one of these little cafes we returned to our hotel in Sloterdijk for some lunch, the rail journey taking less than 15 minutes. After a little rest I suggested we set of by train once again, this time to Zaandijk Zaanse Schans to visit the working windmill village at Zaanse Schans. Getting there from Sloterdijk took only ten minutes and then it was a further 15 minute signposted walk to the windmills. Zaanse Schans is a preserved village of traditional houses, windmills and warehouses providing a glimpse of life in the Netherlands in the 18th and 19th centuries. The surrounding region was an industrial area with hundreds of windmills which were used to power the milling of paper, mustard, oil and other products. Wandering through the village is free but admission charges apply to enter individual museums, workshops and windmills. We enjoyed viewing these characterful houses and looking at the windmills in such a pretty setting. It’s a bit touristy with coach loads of tourists on guided tours but I’d still recommend a visit as it’s a charming open air museum and very photogenic. I noticed that tours to Zaans Schans from Amsterdam cost about €35 but it can be visited easily and at a fraction of the cost by train (15 minutes from Amsterdam) and is included in the regional travel ticket. For our evening stroll we headed back into the centre of Amsterdam and boarded a tram to Leidseplein and from there wandered along to Vondel Park which had many cyclists. We spotted a heron scavenging in a wheelie bin and saw yet more colourful tulips. Leaving the park as it was falling dark we stopped for drinks in one of the cosy bars along Leidseplein before wandering the streets a little more then returning back to the hotel for the night. Thank you for your kind words. It’s good to read that you enjoyed reading this post. Haarlem totally seems like a place I would love to see! How picturesque!!! Love the windmills!! Great shots! Thank you! Haarlem just looked something out of a fairytale with those gorgeous peaked roof houses. I KNOW I would LOVE it there! 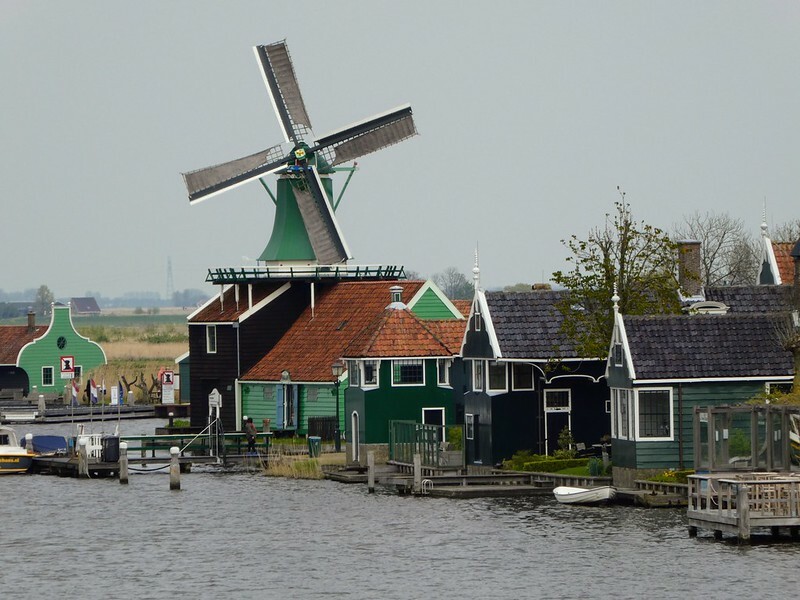 I went to Zaanse Schans and Volendam just last week, such lovely places! I agree with you though, very touristy around the windmills. Seems like you really got to see a lot of the Netherlands on your trip, hope you enjoyed it! Thanks Emma for your much appreciated comments, we had a great time in the Netherlands and enjoyed seeing so many places. your article on Netherland compels me to think for atrain travel there right in October/november.I love travelling and would do so now. you write fabulously . Great Good luck . Thank you for taking the time to read my blog and for commenting. A long time ago we travelled around the Netherlands by train, I’d like to do that again sometime. Holland is very easy to get around by public transport and windmills really are photogenic. Thanks Jo for your welcome thoughts on this post. Love it. Given you a follow! Thank you for taking the time to read my blog it’s much appreciated. Traditional windmills are my favorite. This summer I have found a new one for my collection. Windmills are always very photogenic. Thank you for taking the time to read my post. Glad you made it to Zaanse Schans! We had so much fun exploring the village/museum there! Thanks Jessica, we thought Zaanse Schans was lovely. I definitely agree about those houses, they are true fairytale homes. The windmills were gorgeous too! Thank you for your kind words. What a delightful place to live Irene. I enjoyed Haarlem very much. Thank you for your kind words. 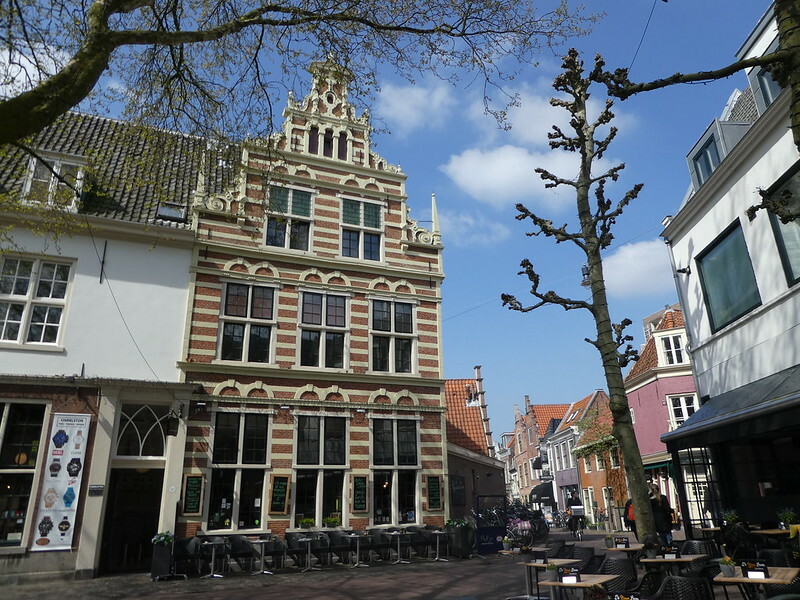 If you get the chance to go to Haarlem again, there is a lovely hofje (sort to hidden courtyards) walk you can do. It takes you down countless small streets and it’s really charming. Haven’t been to Zaanse Schans for years, but you’ve inspired me to go back. Thank you for your inspiring thoughts on Haarlem. I’m sure we will go back sometime and I’ll definitely look out for those small streets and hidden courtyards. Thanks for the tip. 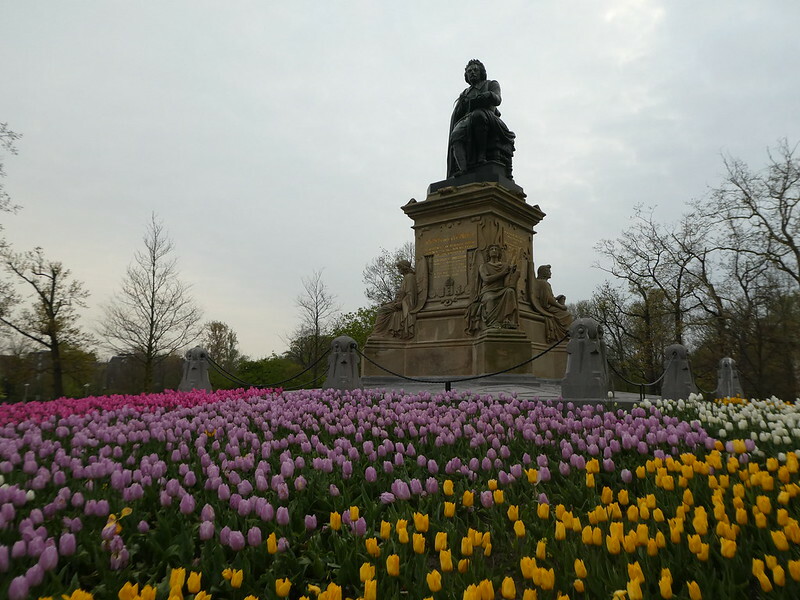 Oh those tulips, and that windmill…. Lovely. Thank you for your inspiring thoughts. Tulips, windmills and cheese – along with canals and bicycles are the icons of the Netherlands. Loved our visit to Holland. So much to see and it was nice to have those small roads where people use bicycles rather than cars. I was amazed travelling through the country to see far up above me the built up canals with barges seemingly travelling in the sky above us. I also loved to see the canals built up onto embankments, it was so pretty alongside all the windmills. Actually there are lots of things you can do in Zandvoort. We have monthly activities that you can actually do and see. We also have a racetrack where the car races. There are beach tents (restaurants) that stays for the whole year and some are only open during summer. But during spring time, it is nice to visit the dunes or the Amsterdamse Waterleidingduinen. Deer, foxes and rabbits freely walk around the vicinity. Thank you for your interesting words. I’m sure that Zandvoort is much nicer in the summertime when it’s warm to go on the beach. The dunes sound inviting too – I would like to have taken a walk there, perhaps I can do this next time I’m visiting Amsterdam. It was very cosy and I enjoyed Haarlem very much. Thanks Marcus – there’s something very appealing about windmills! I’m so pleased you enjoyed this post. The Dutch architecture is so attractive. I really wanted to visit Harlem but we didn’t make it on our trip – hopefully next time as it looks and sounds lovely. 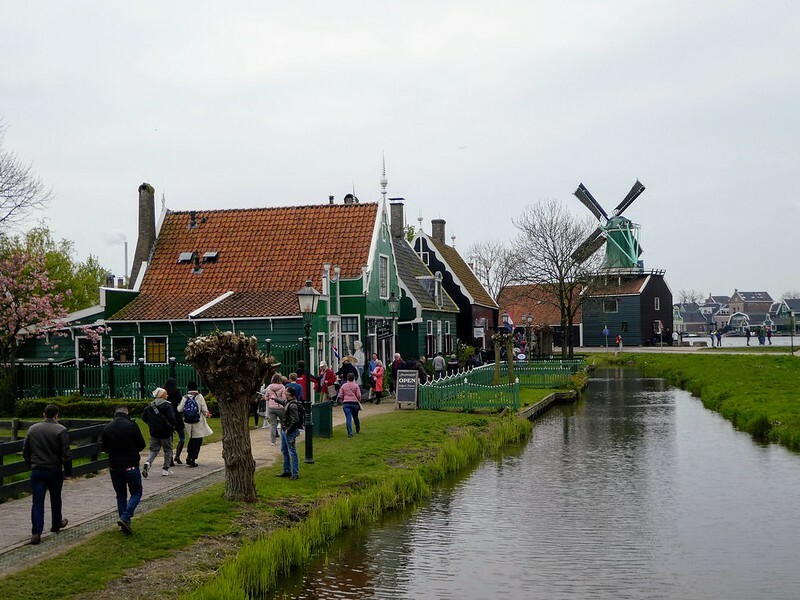 I also fancied a trip to Zaanse Schwans but we ended up having to leave that off our itinerary too (another one for the future), we did get to see the windmills at Kinderdijk though. Thanks for your comments Joy. We didn’t get to Kinderdijk so I’ll look forward to reading your post about it and then we can perhaps go there next time. Windmills are so appealing and Zaanse Schans was so pretty. Those houses are like in a fairytale. They really are just like fairytale homes, so beautiful. Thank you for your kind words. Yep, you really didn’t see the best of Zandvoort. It’s a town I’m very fond of having spent a lot of time there for motor racing. I’m sure it looks much nicer in the summertime. Thank you for your comments. To be fair, it’s not the most exciting town, but when it’s busy and the beachside bars and restaurants are in full swing, it’s a lot better. And the town centre is quite pretty. They look like settings for theatre don’t they? So clean,painted beautifully …. They really do look beautiful, thank you for your much appreciated comments. Apparently you were there in spring which is not the time to visit Zandvoort. Although it is still not a beautiful place in summer it has a lot of beach restaurants in summer and it is crowded with people of Amsterdam enjoying the beach. But renting a bike and cycling through the dunes north of Zandvoort towards IJmuiden and Velsen or southwards towards Noordwijk is worth the physical effort. Thank you for commenting. I’m sure it looks much nicer in summer when things are open and people are about.